Recently, I was invited to join the Freshly Made Sketches design team. I jumped at the chance as I love this team’s sketches and designs, and have played along with many of their challenges since I found the website a few months ago. This is my first week to be on the team, and Linda has a great sketch for us. I had made some paper flowers months ago and decided to not use them on the project for which I made them. They’ve been sitting on my desk all this time as I couldn’t bear to throw them away. I knew they would eventually find a home. When I saw this sketch, I knew immediately that I could use them. 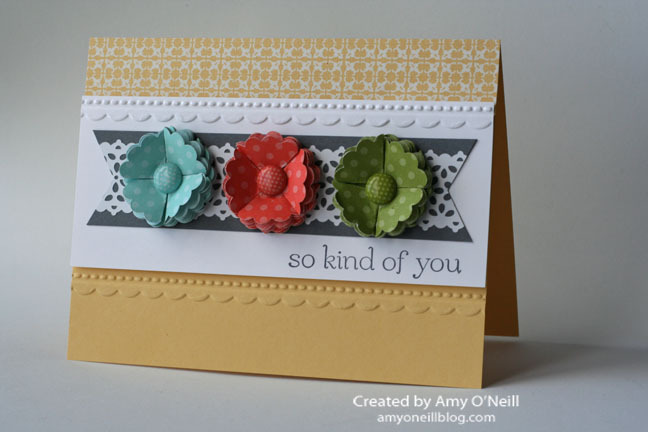 I used the 1-1/4″ Scallop Circle punch to make the flowers. Here’s a link to a tutorial by Kelly Goree on how to make them if you’re interested in making some of your own.